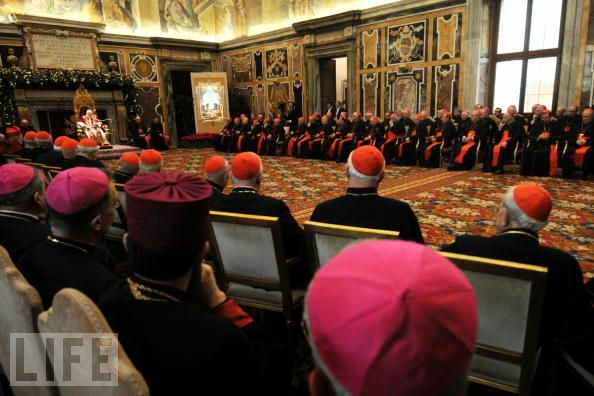 The scourge of child abuse, the Synod for the Middle East and the Apostolic visit to the UK were the principal themes of the Holy Father's annual Christmas address to the Roman Curia earlier today. The stigmata of my spouse remain fresh and open, until the wounds of the sins of men are opened. What keeps open the wounds of Christ is precisely the fault of priests. They tear my clothes because they are transgressors of the law, of the gospel and of their priestly duties. They take away the splendour of my mantle because they completely obscure the precepts imposed upon them. They soil my shoes because they do not walk on straight paths; that is, the hard and sever paths of justice, and they also do not give a good example to those subject to them. Nevertheless, I find in some the splendour of truth. The Holy Father goes on to speak of the culture of the 1970s in which paedophilia was approved by many as something acceptable. He also points to that consequentialism in morality which made such an awful position possible. In order to assert the identity between the concept which Newman had of conscience and the modern subjective understanding of conscience, people like to refer to his words according to which - in the case when one has to make a toast - that he would have drunk first to conscience and then to the Pope. But in this affermation, "conscience" does not mean the ultimate obligation of subjective intuition. It is an expression of the accessibility of the binding force of the truth: its primacy is founded in this. The second toast may be dedicated to the Pope because it is his task to demand obedience in the face of the truth.